The guy who is in charge of UI design for Windows Home Server now has a blog, and is going to soon write a post about how the UI evolved, including prototype screenshots. This could be very interesting to see. 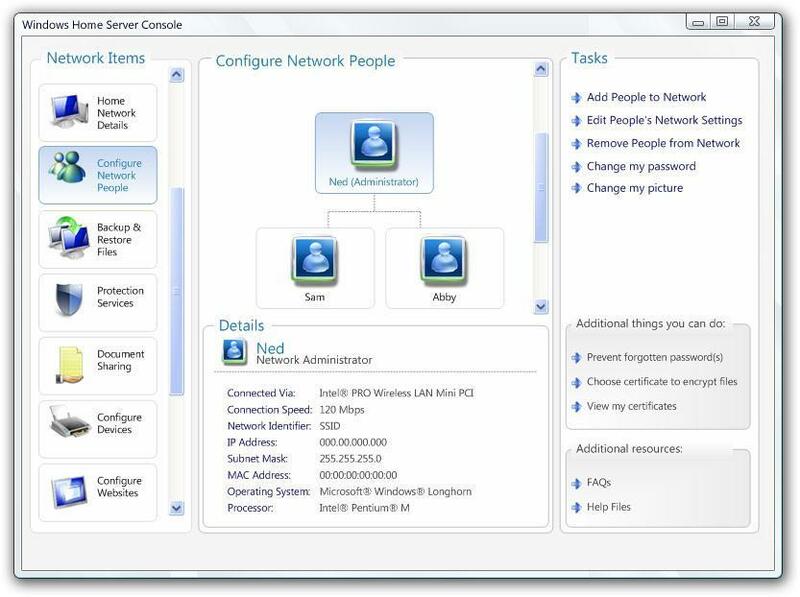 So over the next several weeks I’ll be sharing the complete history of the of the Windows Home Server console, including the first prototype UI from my first week almost two years ago. Watch this space, hopefully you will find the look back informative and insightful. 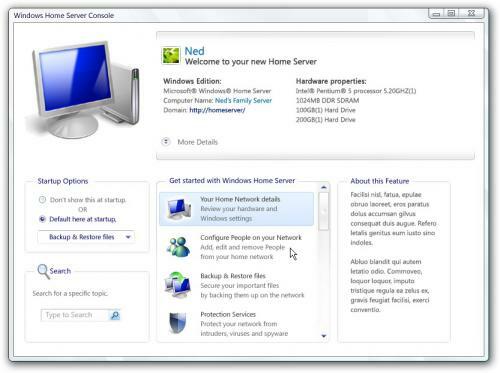 The Windows Home Server blog (http://blogs.technet.com/homeserver/) linked to this blog recently, so I decided to have a read through the guy's posts. It looks interesting. I know it is just a mockup, but really Penitum 5 Proccessor @5 Ghz? How long will it take for them to realease this? Aside from that it looks good. but really Penitum 5 Proccessor @5 Ghz? How long will it take for them to realease this? obviously now it would be something like "Intel Quad duo @ 3.0 GHZ"
You can't add up the individual core/processor frequencies. And why should a simple home server have 4 dual-core CPUs? I believe even two cores are overkill for a dedicated home file, maybe web server. No, having multi-cores would be pointless on something like that. Its only going to be doing one thing most of the time, and to a very limited group of people. anyway, i doubt 5 Ghz soon, considering efficiency is the word now, no frequency.. Speaking of linux I just tried Ubuntu. Got bored after 30 mins after finding there were no drivers for my wifi card, and the only way to get it working was to use something where I have to type stuff into a command line for 30 mins. Not my idea of modern if you ask me. Why should I have use a shell/command line these days? I mean why can't linux be like windows and use a GUI for everything. OK, I accept some stuff is better in command line but installing a Wifi driver? Thats just crap. One more reason I hate linux. Windows for teh win. the only way to get it working was to use something where I have to type stuff into a command line for 30 mins. Not my idea of modern if you ask me. you have to do everything via command prompt and it is very basic OS. Fedora 6 has out-of-the-box support for almost EVERYTHING, or at least generic support that can either suite you or last you long enough to get the real drivers. plus ubuntu BLOWS as a server, BLOWS as an OS and generally sux. Linux is a community OS, its open source and its free, so it is superior to windows in every possible way. and it uses way less the windows Vista, but has everything and more that vista does. Windows had an advantage and it lost it. Can we end that fanboyism, please. So when do they plan to release this? because i just installed in in vmware (pretty fast install.....) and it really wasn't what i was expecting.. Anyway I only said how much I hated linux because everything is so difficult to do. I prefer to stick with what I know, eg windows. true. once again, its opinion. Windows is easier to learn and thus use, however once you learn linux, which takes along time, it is much more powerful. So, the tyrannical dictator of BA is above the low law of miserable plebeians, eh? how recent is the Home Server in the BA archive? I think it was the first release of Home Server. Yep, build 1301 to be exact. That 120Mbps WLAN wouldn't be that bad.